GreenGro Ultrafine is a soluble blend of mycorrhizae, beneficial bacteria, kelp and humic. This highly-effective and easy-to-use, all-in-one product will dramatically improve the health and vigor of your root systems. The Ultrafine blend is perfect for hydroponic and soil drench applications. Great for all types of soft rooted plants such as fruits, vegetables, herbs and flowers. 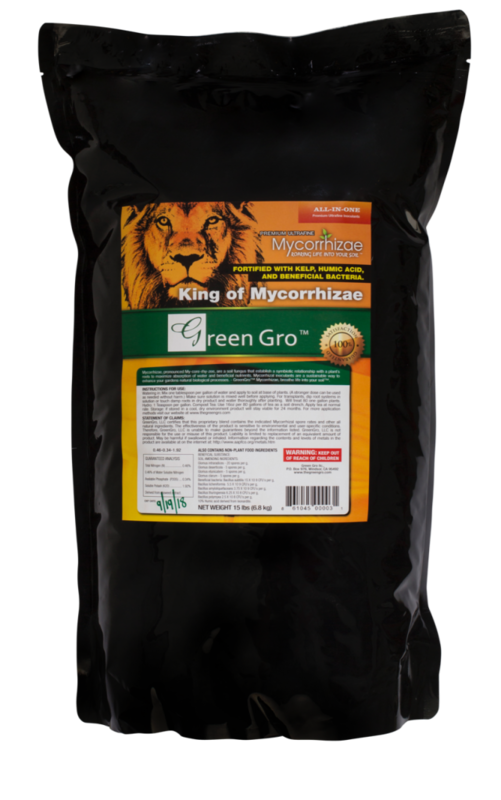 GreenGro mycorrhizae blend contains a diverse selection of endo mycorrhizal fungi and beneficial root colonizing bacteria. It creates a network of micro filaments and microbes that act as an extension of the plants’ root system. Beneficial bacteria help the plant by secreting enzymes that the plant uses for a variety of tasks including vigorous growth. This blend also contains premium grade soluble kelp and humics to help prime your roots. Together with the beneficial microbes, it breaks down and transfers nutrients to the plant with greater efficiency. Glomus intraradices: 20 spores per g.
Glomus deserticola: 5 spores per g.
Glomus etunicatem: 5 spores per g.
Glomus clarum: 5 spores per g.
Bacillus subtilis: 15 X 109 CFUs per g.
Bacillus licheniformis: 5.5 X 109 CFUs per g.
Bacillus amyloliquefaceans: 3.75 X 109 CFUs per g.
Bacillus thuringiensis: 6.25 X 108 CFUs per g.
Bacillus polymyxa: 2.5 X 108 CFUs per g.
Mix in 1 Tbsp. per gallon of water and apply to soil at base of plants (a stronger dose can be used as needed without harm). Make sure solution is mixed well before applying. For transplants, dip root systems in solution or touch damp roots in dry product and water thoroughly after planting. Will treat 80 one-gallon plants. Use 16 oz per 80 gallons of tea as a soil drench. Apply tea at normal rate. If stored in a cool, dry environment, product will stay viable for 24 months.